Much was made of the muted celebrations expected at Celtic Park on Saturday due to the shared affection many of the actors have for both clubs, but Neil Lennon will have been celebrating a tactical victory after taking Brendan Rodgers’ invincibles to the brink of their first loss in 57 domestic games. The Hibs boss took full advantage of Scott Brown’s absence by setting effective pressing traps to exploit Ntcham, while his midfield diamond nullified Celtic’s wing play. It was a highly entertaining ninety minutes, which, while largely devoid of sustained periods of possession play or final third patterns of movement, may offer other managers in the league food for thought as to how to limit the champions’ build-up play. Hibs can feel unfortunate not to have taken all three points away from Glasgow at the weekend as for large spells of the game they were the better side. Central to this was how they denied Celtic’s deepest midfielder possession – on this occasion Olivier Ntcham. Although Celtic went with a 4-3-3 at Ibrox, the asymmetrical nature of their back four meant that when building out from the back they still took the form of a back three the same as against Hibs, albeit in a more conventional 3-5-2 set-up. Lennon decided to use two wide forwards as a means to stymie Celtic’s midfield. Pedro Caixinha may in hindsight rue his decision to use Alfredo Morelos as the lone striker after seeing how effective Anthony Stokes and Martin Boyle were in actively dictating the direction of Celtic’s play. The Colombian was helpless to stop Lustig, Simunovic and Boyata from playing around him a fortnight ago but the narrow diamond formation backing up Hibs’ front two was a huge success overall. There is no doubt that captain Scott Brown was missed by Celtic as Ntcham struggled throughout, but that was not just down to the added responsibility bestowed upon him in terms of controlling the tempo, Hibs played their part in giving Celtic a puzzle to solve; one in which they often struggled to overcome. Dylan McGeouch acted as a screen when Boyata had the ball, refusing to engage, instead, mirroring Ntcham’s movements behind him to block the pass into midfield. The decision not to press Boyata is a tactic used in Scotland before to exploit his tendency to lose patience when there are no obvious passing routes. He can become static with the ball and can be prone to heeling passes over distance due to the ball becoming stuck under his feet. McGinn stuck with Tom Rogic while Slivka marshalled Callum McGregor, with the former having to resort to in-to-out movements to get on the ball, which took him into the channel onto his weaker side and forced him to commit the athletically superior McGinn one versus one. McGinn’s ability to read the game high up the park was utilised perfectly as he won the ball back seven times in the first-half. Stokes and Boyle each cut off the square ball to Tierney and Lustig, while positioning themselves narrow enough to prevent the ball from travelling through to wing-backs Hayes and Forrest. When Celtic did pass to Rogic, in particular, McGinn pressed his first touch intensely to ensure that the Australian had to take his first touch backwards. Stokes then applied pressure from behind to cut off his option to triangulate possession by playing to Rogic. These traps worked well for Hibs, with Ntcham toiling for the majority of the match under McGinn’s presence. When the ball did get through to the Frenchman McGinn vacated his marking role to pressurise, Bartley came across to fill this role while Ambrose picked up Edouard. At around the midway point of the first-half Ntcham and Boyata began to come to grips with Hibs’ structure. Ntcham repeated the same movement on numerous occasions, moving against the grain to find space. He used Boyata’s body position as a disguise so that if he looked to play left and the Hibs block shifted accordingly, he would make a short horizontal run in the reverse direction. Celtic’s experienced stunted build-up because their midfield line had little depth. Rogic and McGregor were too flat with Ntcham, and the lack of a number ten was obvious. In the second half Celtic were able to manoeuvre the ball into the middle of the park much easier now that Sinclair’s introduction had seen Rodgers revert back to a 4-3-3. One negative from the switch which Hibs were able to exploit was Kieran Tierney’s lack of aerial prowess at centre-half. Anthony Stokes continuously made runs from Boyata to Tierney’s side with Whittaker aiming to force the Celtic defence deep. Hibs were able to gain territory via picking up second balls, as seen by McGinn’s second goal. It meant Bartley was no longer spare to provide a layer of protection as Rogic’s advancement meant that should Hibs’ line be broken there was space to drive into. Ntcham started from a higher up position, coming ball-side of the line of pressure to receive the ball. 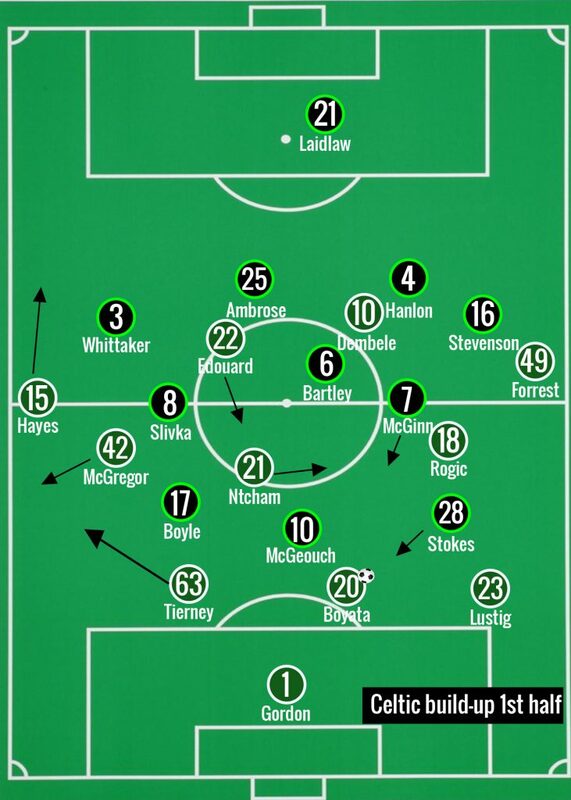 Hayes and Forrest’s directness in 1v1 situations was limited in the first-half due to the shape being too narrow and, without an overlapping full-back, Celtic struggled to create overloads in the wide areas. McGregor took up a position as a narrow left-back to get on the ball in the first-half, but this sucked in Slivka and blocked off the wide area ahead of him that Hayes was operating in. Edouard’s tendency to roam towards the left dlank also crowded the space for the ex-Aberdeen winger. Celtic’s usually electric wide left area was invigorated at half-time courtesy of Scott Sinclair’s introduction, with Hayes shifting back one to support. There were at least three occasion where Sinclair’s trademark runs inside led to chances after some quick combination play at the edge of the box. McGregor’s development in the last eighteen months has been exceptional, and his redeployment alongside Ntcham helped Celtic’s possession play improve.